Here is my 1991 Kona Explosif. Its a one owner bike and came with a set of pace rc30 forks as a warranty upgrade on the original track2 forks. It was used as a commuter for the last 4 years without seeing a bucket. Everything was covered in black oily dirt. 2 cans of degreaser later all the components move freely and are in reasonable condition given the parts look to be original. To get the bike working again I have had to replace the original grease port bb to a shimano un55 bb. Replace all the inner and outer cables with jagwire cables. Replace the heavy wire bead commuter tyres with repro panaracer smoke tyres. Finally swap out the original seat with my preferred seat (a £20 chinese carbon Jobby). I also replaced the pace fork to a triple butted project2 fork. 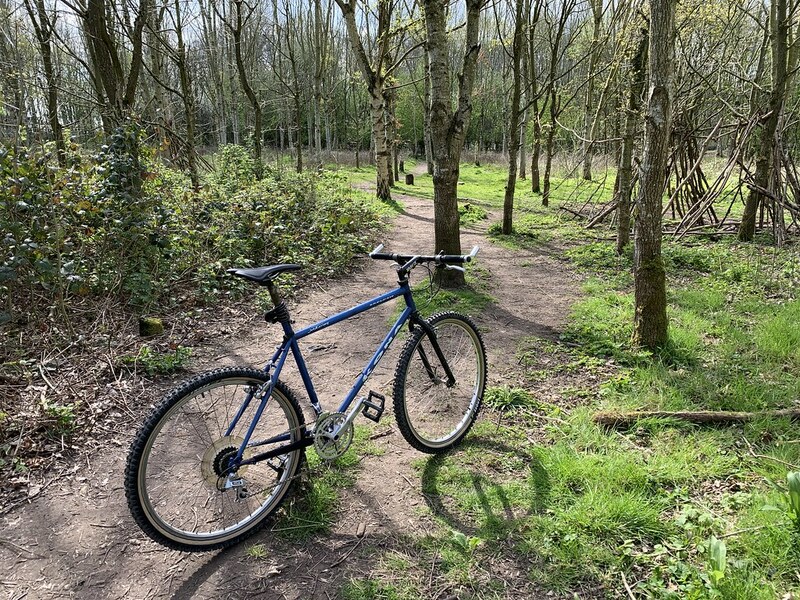 Its maiden voyage under me was along the canal manchester to lymm where I found a little woodland that I could test out its off road ability. Last edited by Samdrog on Sun Apr 14, 2019 10:23 am, edited 1 time in total. You will need to either reduce the picture file size to add it to a post, or link your photos to a Picture Hosting Site. There's a thread on this subject where PeachyPM has documented the maximum pixels width as 1080. Thank you. Managed after your link. Konas from 1991-93 are my favourite-looking. I'd have the dork disc off, especially since it's cracked, but otherwise it looks great. The dork disc going soon as I'm looking to build a pair of wheels for it. The current ones are old and past it. The front is original I believe. The rear has a BOS sticker and an American flag on it. Im unsure of the brand. The paint is rough and bare steel is visible in areas. There are no dents anywhere so its a very good starting point. I know from looking at the 1991 catalogue that the frame should be a purple/blue colour. Does anyone know of the paint colour for it? Looks great, would be nice to see some more pics. Those woods look really nice too.